Hey! I am a little behind in sharing the Kit of the Month for February with you! So sorry! ﻿﻿﻿﻿ Nancy O'Dell describes her collection as being "...about love – love for a sweetheart, love for a child, love for a parent, a pet or a place – pure, innocent, honest love. The Love Series blends gently worn icons and images with lively young colors to match the energy and emotion of your photos. Love grows old, but it never fades!" How true! When I got the addition pack and started playing with the papers, I used photos of my husband and sons, but soon realized that the papers and stickers would work very well with photos about places, pets and things we love as well. 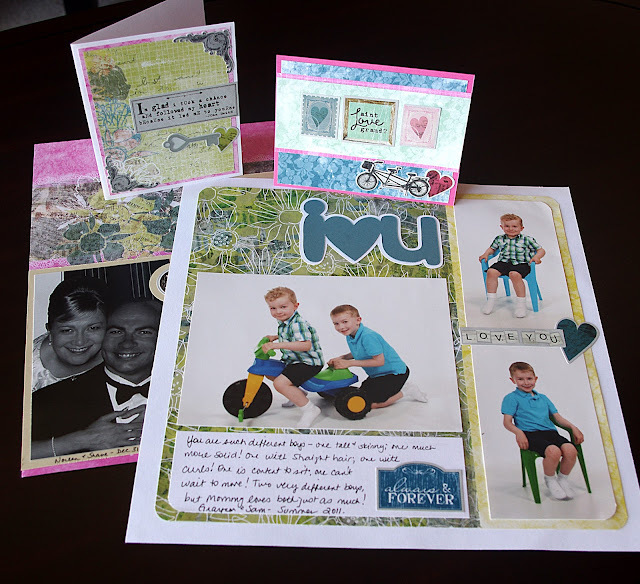 The papers and photo mats are rich and varied, and right on trend with the vintage theme. 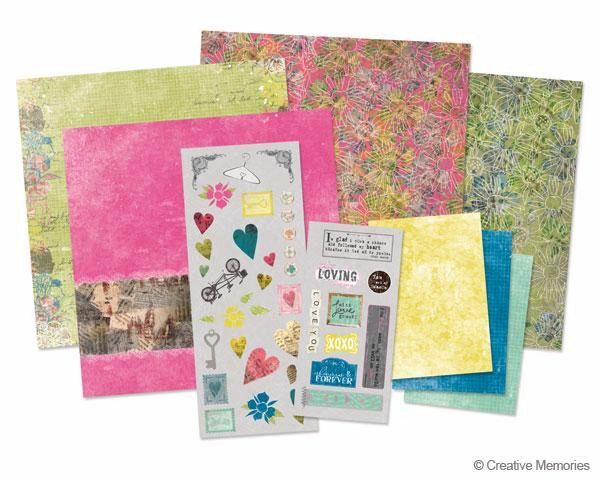 The stickers have a lot of detail and will enhance many different types of pages. We had a great time last month at our Kit of the Month Workshop and my club ladies are coming again this Friday, February 10th at 7:30 pm. If you would like to join our club, I have a few extra kits prepared and we'd love to have you - just let me know asap and I'll "set a place" for you! Kits are only $15.00 per month and include everything you need to create two 12 x 12 layouts and two greeting cards with envelopes. There is no additional charge for the workshop...just bring your adhesive and possibly some photos of people/things you love! Have fun scrapping this month all the people and things YOU love!